We had already finished the first part of the second para of kaliyan aruL pAdu here. Now the next few lines. emperumAn was looking for a way to reform AzhwAr and found out a way. emperumAn thinks of a way to reform AzhwAr and concludes that he cannot be reformed with sAstrAs but He finds that AzhwAr has a kind of attraction towards beauty ( azhwar describes the beauty of the ladies he was interested till then here “ vERkaNAr - 1.1.4” meaning ladies with eyes similar to that of a spear ) and decides to show his eternal beauty (nithya) and reform him unlike those azhwar was interested till then(anithya), his sowseelya, and also reveals the enlightening thirumanthram to him and emperumAn also shows all archAvathAra divya dEsams. AzhwAr is then diverted to the dhivyadhEsams which gives him full anubhavam. AzhwAr started his first pAsuram with vAdinaen which shows that how much AzhwAr had destroyed his Athma swarUpam. ukaNdharuLiya dEsangal are those where perumAl wishes to reside. 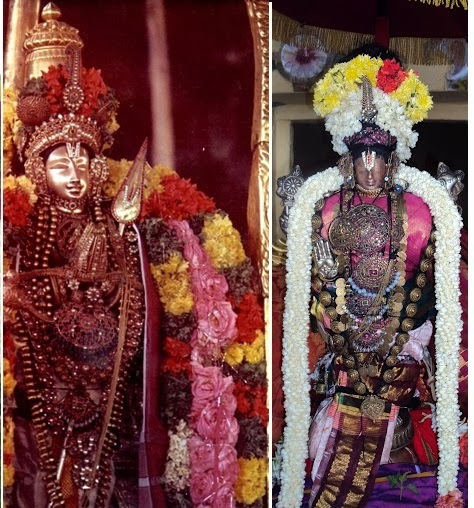 According to AzhwAr, archavathAram is the only way for Achrayanam for us as seen earlier. srIrangam is the root of all the divyadEsams . Even after sarrumurai, we say"srIman srIranga sriyam anubhadhravam anudhinam samvarddhayA" and "aranganagar vAzha". This doesn’t mean that all other divyadEsams should not flourish. If srIrangam flourishes, all the others will flourish.srI rangam is the place for all bhAgavathAs . kulasEkara AzhwAr says this as “ aRRa paRRar chuRRi vAzhum aNthanNIraranGkam”. Thus we have finished first two paras of kaliyan aruL pAdu.